Building your log home or timber home with the finest timber harvested...respectfully. 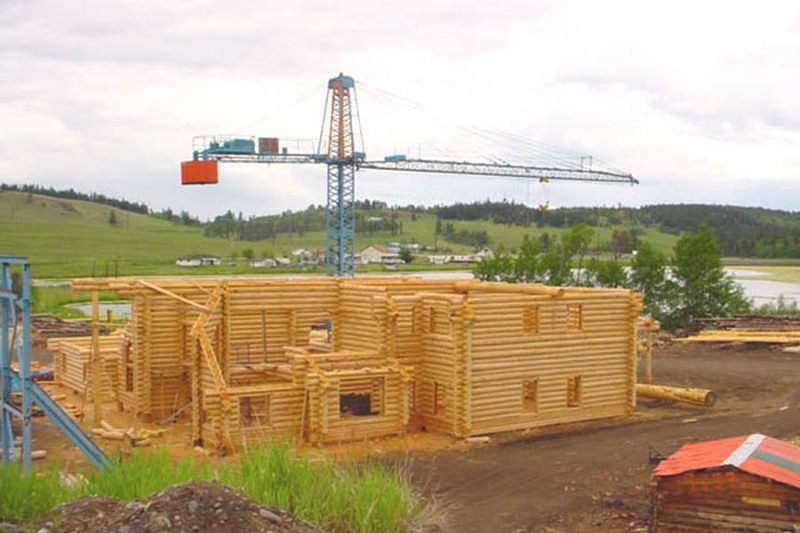 Sitka Log Homes construction yard is located in 100 Mile House, BC Canada. 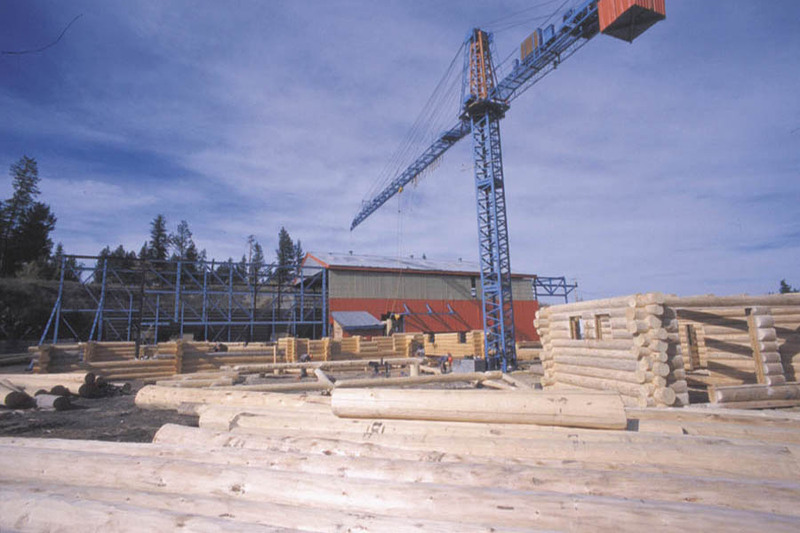 Our custom, handcrafted log homes are built under a 10,000 sq.ft building with overhead bridge cranes. This ensures efficient, cost effective construction while also providing protection from the elements during building. 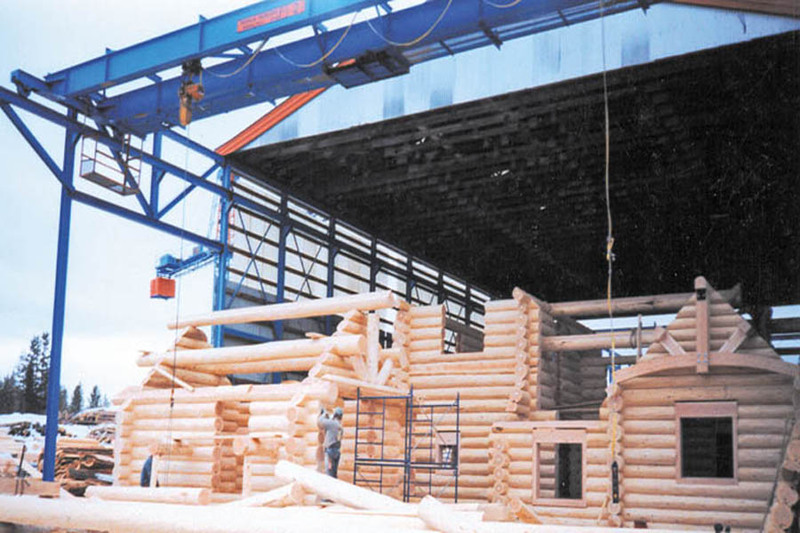 Upon completion of the log shell in our construction yard, the home is re-inspected for quality and then it is number coded and loaded for shipment. When the log home arrives at your future home site, an experienced member of our company will be on hand to assist and supervise the re-erection of the log package. Although time may vary, 2 to 3 days is typical. We always stock a large and constant inventory of raw logs. Sitka Log Homes foresters choose premium quality old growth tight grained timber from our northern BC forests. Foresters are committed to promptly replanting. Always environmentally concerned, much of the timber we use now is dead standing timber which is also easier on the environment to harvest. One aspect of our timber harvesting includes heli-logging dead standing timber. Building with timber which has been drying naturally before it is harvested greatly reduces the shrinkage encountered when building with green logs and eliminates the need to harvest live trees. Wood species we offer are Englemann Spruce, Lodgepole Pine, Douglas Fir, and Western Red Cedar. These log species are all native to BC forests and by using our local timber we can also avoid extra damage to our environment through excessive trucking. Note: As your log home is being built in our construction yard, we take photos of the progress. These photos are then posted on a personal web site that we create for your project so that you may view your handcrafted log home as it is being built. You always know what stage your house is at in our construction yard regardless of where you may be in the world. At Sitka Log Homes, we prefer not to utilize logs that are harvested from green forests. We prefer logs that are from trees that are standing dead from natural causes. Many of these logs are typically not harvested for conventional milling of wood. For example, we use flared ends of logs and logs with interesting curves and markings for character logs as well as utilizing logs that are standing dead and therefore much drier at harvest. Also, we often use the root portion of some trees for features within our homes. Therefore we use many logs that otherwise would have been left to rot or burn in the forest. Log homes are a high-value added product and Sitka Log Homes goes even further by encouraging the use of character logs by highlighting the unique beauty of this wood in our designs. As BC continues its battle with the Mountain Pine Beetle, Sitka Log Homes has, for several years, utilized the naturally seasoned trees of our forests devastation and have successfully marketed the Mountain Pine logs worldwide to educate clients about the strength, sustainability and natural beauty of this wood. Note: The premature dying of these trees is caused from the interruption of sap flow and the timber is not violated by any insects, consequently there are no holes or insects in the wood. The main equipment for construction at our facility is our electric overhead cranes, which use very little energy during construction. These cranes are very quiet and do not burn or use fossil fuels like mobile cranes. We strive to acquire our wood from sources within 150 km's. from our facility, therefore reducing emissions caused by long hauling. It requires only 150 cubic meters of wood to employ one full time person per year at our facility. This amount of wood would last about three 8 hour shifts at a conventional sawmill for one employee. Our solid waste, such as log ends and lateral cuttings, is used by locals for firewood as well as shipped to a local meat packing facility to be used to heat their hot water system. At other times, it is shipped as hog fuel for co-generation heating at a local mill or for electricity at a nearby electrical co-generation plant. Our waste wood is only 10% of our total wood consumption. Our waste only consists of bark peelings and log ends. Logs that are not suitable as house logs are sawn into timbers and log siding. The argument may be made that log homes consume more wood to construct the walls and roof members. However, log home construction eliminates high emission producing materials such as gypsum, fiberglass insulation, exterior sheeting and vinyl or metal siding. The life of a log home is only dictated by how well it is maintained. 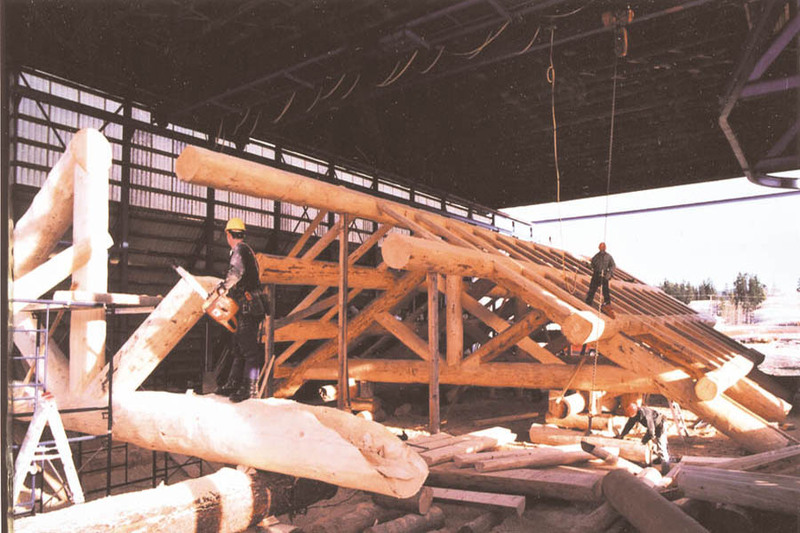 There are log homes that have stood for hundreds of years (Cathedral of Trans Configuration at Kizhi, Russia for instance) whereas traditionally built stick frame homes generally only last 40 to 50 years before they need to be replaced. Even at that, the exteriors generally are refinished with new siding every 10 to 15 years. Think of a log home as a stone fireplace. It absorbs and radiates heat in the winter and remains cool in the summer. Test results have shown that log walls are significantly better than walls in conventional homes for retention of heat in the winter and coolness in the summer. 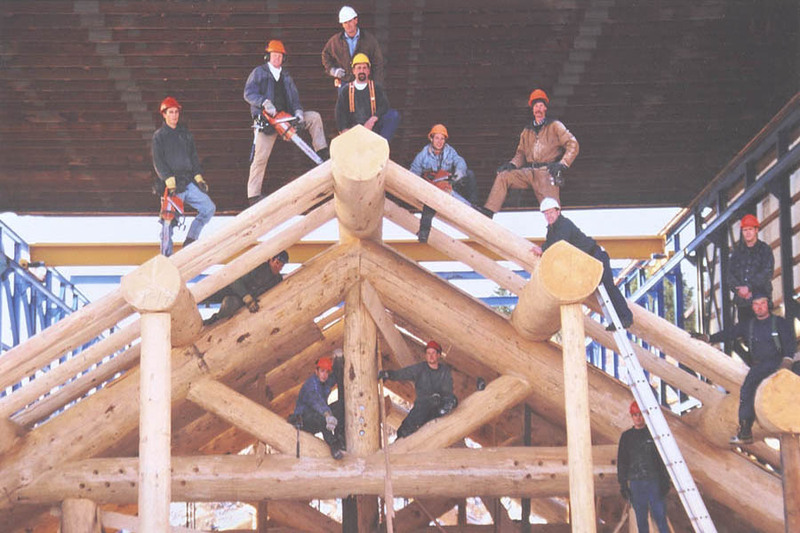 One such test on a log wall constructed with 10" diameter logs exposed one side to temperatures of 1100 ° C for 3 hours and the opposite side never achieved a temperature higher than 48° C. (ILBA News, Issue 35, September 2001).